"Close to the foot of the majestic and still active Mt Agung, Dukuh Sibetan villagers are only too aware of their precarious existence. When the volcano erupted in 1963, sand and rocks blanketed the village farmlands, making a return to normal agriculture impossible. One of the few crops that were able to survive in these new conditions, however, was salak- the snake fruit, already present in the area for hundreds of years." 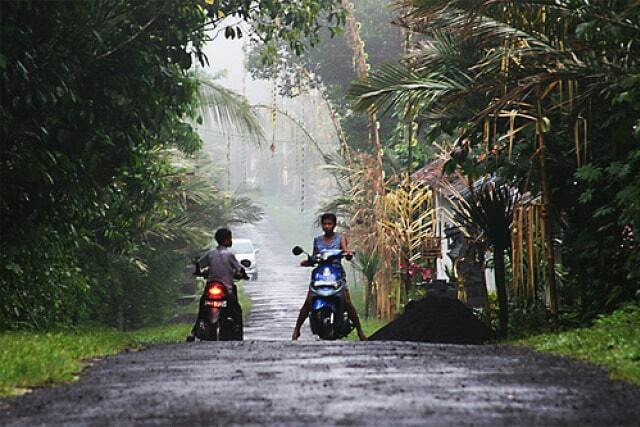 Dukuh Sibetan is a village at the foot of the active volcano Gunung Agung, on the road from Rendang to Amlapura. After the last eruption in 1963 Dukuh Sibetan was covered with a layer of ash and rocks so any kind of farming was impossible. The people of the village are aware of their dangerous position. Cultivating the land for agriculture (eg. rice) was impossible. Outside the village Sibetan is surrounded by rice fields and forests. The village lies at an altitude of 400 to 600 meters. One of the few crops. who could survive after the eruption, was the Salak-palm with its snake fruit. The name "snake fruit" with its little white flesh inside has a skin that looks like even snakeskin. As a blessing in disguise is Dukuh Sibetan now the specialist in Salak. The farmers of Sibetan have collected of the Salak-palms over the years seeds and they discovered new species of snake fruit. At present there are fourteen species of Salaks grown here. Ten are considered very rare. 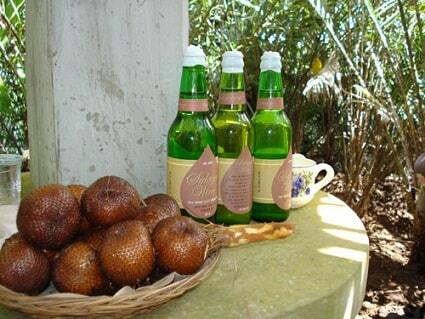 The villagers now make their own sweet Salak wine. is a very short-stemmed palm, with leaves up to 6 metres long; each leaf has a 2-metre long petiole with spines up to 15 centimetres long, and numerous leaflets. The fruits grow in clusters at the base of the palm, and are also known as snake fruit due to the reddish-brown scaly skin. They are about the size and shape of a ripe fig, with a distinct tip. The pulp is edible. The fruit can be peeled by pinching the tip, which should cause the skin to slough off so it can be pulled away. The village itself is quiet and traditional, blessed with a cool, clean air and a sense of real peace. Sibetan is one of the four JED villages. JED is the Balinese Village Eco Tourism Network. This organization tackles tourism in a very special way. In these villages, life is still quite common. 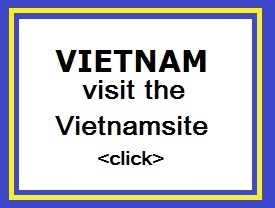 The people are very hospitable, but there are no special facilities for tourists. A walk around the village offers you breathtaking vistas of mountains, palm trees, picturesque villages and in the distance you can see the blue ocean. Dukuh Sibetan Salak is surrounded by gardens and woodland, dotted with small paths. A beautiful pond, full of stories and mythology, is located at the bottom of a high cliff, equipped with vines and spring water. 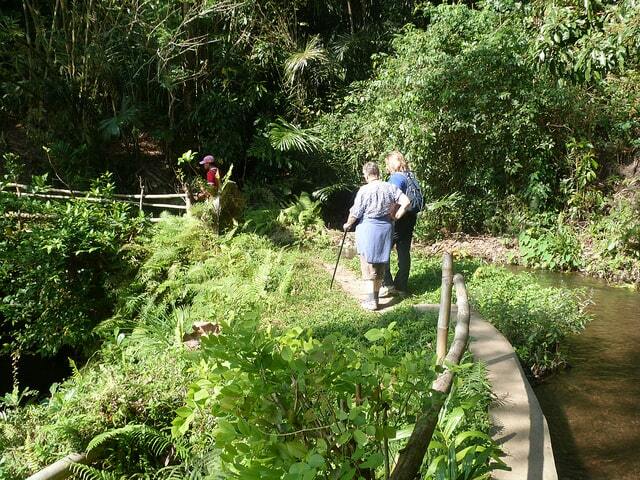 When visiting Dukuh Sibetan you can help with picking the snake fruit. The Salaks are not too big but have the strangest forms. The residents of the village will show you how the pineapple-like fruits are made into wine. Women, who want to visit the village, can build up the day with the women of Sibetan. They may help with cooking and preparing for one of the upcoming ceremonies. The residents of Sibetan are in fact very religious and often they have special ceremonies and festivals. It would be nice if you could experience such a festival, but to help the women is perhaps even more fun. If you choose to spend the night in Dukuh Sibetan, you will stay with the family in family home stay. The family dress up the room of the family members who stay out of the village for education. Stay with the family will give you opportunity to chat with the family members and experience how they spend their time in the village. Sibetan is surrounded by rice fields and forests. You can make a hike from the village to Tenganan or towards the sea in about four to five hours. The tour takes you through forests and you'll have a wonderful view of the volcano Gunung Agung and the ocean far away. 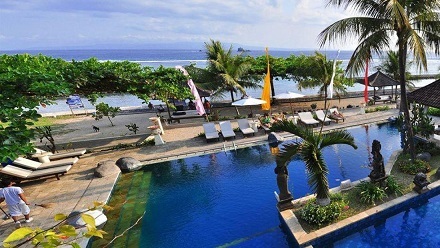 Tenganan is also located on the east coast of Bali. It is surrounded by high mountains. Tenganan is an old fortified village. It goes back to at least the 11th century. Tenganan has certain traditions that have been lost on the rest of Bali. You notice it when you enter one of the four gates of the village. Should you wish to visit the temple Besakih then you have to make a steep climb along the Agung. The temple is situated namely six miles away from the crater. This hotel is located on a small secluded beach of silvery black sand with plenty of great restaurants within walking distance. The main road in Candidasa is a 10-minute walk from the Puri Bagus Candidasa Hotel and offers a great selection of restaurants offering traditional Balinese and Western cuisines. All rooms and suites are decorated in a traditional style with furniture made from shiny coconut wood. A secluded open-air shower area with a small tropical garden is a definite hit with visitors here. The beach in front of the hotel is an idyllic spot to unwind, either over a favorite book or while enjoying a relaxing Balinese massage on one of the traditional beds on stilts. When you're ready to book a room at Puri Bagus Candidasa Hotel, please enter your travel dates into the secure online booking form and click.